Visitors often go to Old Town in San Diego for shopping; some of the shops carry nice handicrafts. They may also go to have a big platter of tacos and enchiladas washed down with a margarita. While you're there, try to look past all that for at least a few minutes. Poke around inside the historic buildings, imagining life in early California. 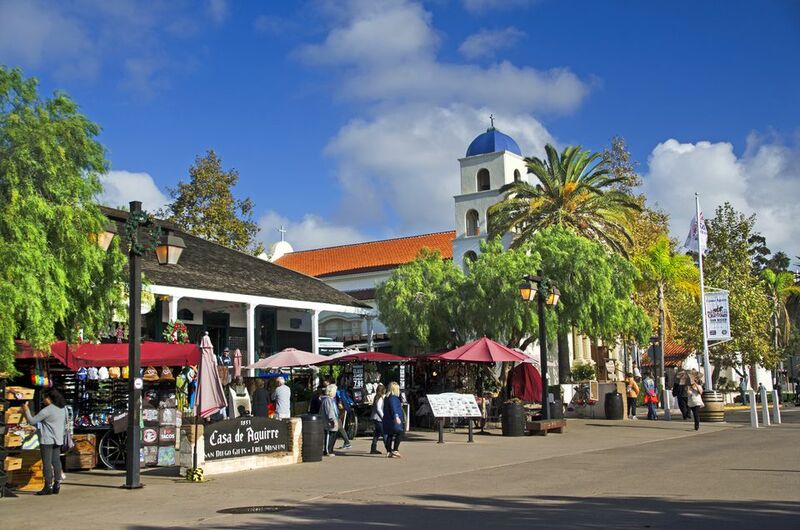 Old Town San Diego was the first European settlement in what is now California. In 1769, Catholic priest Father Junipero Serra founded a Spanish mission here. By the 1820s, settlers moved closer to the water into the Gaslamp Quarter, leaving "Old Town" behind. Today's Old Town San Diego centers on the oldest area of the first settlement. It includes a state historic park and related historical sights outside the park. The State Historic Park occupies nine square blocks and preserves many historic structures. Five of them are built of adobe bricks. They include California's first schoolhouse, the state's first newspaper office, a blacksmith shop, and a stable. These preserved buildings, each a small museum in itself, give a glimpse of San Diego life from 1821 to 1872. Shops sell lots of Mexican-style pottery, tinwork, and the like. If you just want to stroll and shop, it will be easy, and you can extend your route outside the park and down San Diego Avenue. Even if you're a history buff, it takes a concerted effort to stay focused on the historical buildings in Old Town San Diego. Free, guided tours of Old Town San Diego that leave the visitor center daily, are a good way to learn more about California's early history. Living History demonstrations of life in the nineteenth century are another fun way to connect with the past. The park celebrates lots of holidays and historical events. During December, Holiday in the Park brings performance tours and recreations of the holidays in the 1860s. If you enjoy a good ghost story, try one of the evening tours that start in front of Casa de Reyes. If you're looking for something more serious or if you're a history buff, try Old Towns Most Haunted. A local ghost hunter takes you on a walking tour of paranormal hot spots, using real ghost hunting equipment. This tour is the only one that gets you inside the historic Cosmopolitan Hotel after hours, where you will try to detect ghostly encounters. If that isn't spooky enough, you also get to see a 3D video that your guide has compiled during his ghost-hunting forays. After this tour, you won't be able to stop looking in windows for the woman in black or listening for that lonesome cowboy's footsteps. And you won't forget what it feels like to be in a vortex. If humor and just plain fun are more your kinds of ghost tours, then Haunted San Diego is for you. Their tours use a shuttle bus to tour the haunted spots of Old Town. Guides dress in costumes and deliver the information in a fun and theatrical manner. This tour considers itself a "storytelling adventure," and a light-hearted, funny, good time. Old Town area restaurants run toward the touristy side. Servers often wear ruffled Mexican dresses, taking orders while dodging strolling mariachi musicians. Portions are huge, so order conservatively, even if you think you're hungry enough to eat the entire menu. In the northwest corner of the historic town square, you'll find more restaurants and shops at Fiesta de Reyes. Patio dining here is pleasant any time of day. The Mexican food never seems to change even though the name of the place does with some regularity. Bazaar del Mundo, once located here is now at Taylor and Juan Streets. The Old Town Market sits at the edge of the State Historic Park and provides more shopping opportunities. You can tour a reconstructed 1853 adobe house, and a restored convent built downtown in 1908 and a new theater. There's also a museum of archeological artifacts. Whaley House: One of two certified haunted houses in California, just two blocks down San Diego Avenue. Junipero Serra Museum: Built on the site of California's first Spanish mission, it honors the Father of the Missions. Exhibits include artifacts from the early settlement. Two blocks up Mason Street from Calhoun. Mormon Battalion: Tells the story of a 2,000-mile march to aid United States troops during the Mexican-American War. Near the intersection of Juan and Harney. Sheriff's Museum: Celebrating the history of law enforcement. On San Diego Street just past Arista, next to the El Campo Cemetery. Heritage Park: Seven Victorian-style homes built between 1887 and 1910, preserved in a park setting. Juan Street at Harney. Old Town offers a charming, romantic mix of whitewashed mud-brick buildings and Spanish tile roofs. The wooden storefronts look like many Old West towns. In many ways, though, it's more a theme-park-style concoction than a slice of real history. Don't misunderstand that. The state park does a good job of preserving the historical framework. It's the odd complement of manufactured Mexican-ness that seems manufactured. And it has little to do with what Old California was or what San Diego is. We rate Old Town San Diego 3 stars out of 5. Its historic buildings appeal to those who love history, but otherwise, the shops cater to casual souvenir shoppers. And you can find much of the merchandise sold here at lower prices elsewhere. We asked our readers to rate Old Town and more than 1,400 responded. 57% rated it good or awesome, and 29% gave it the lowest possible rating. Head to San Diego Avenue at Twiggs Street. By automobile, Exit I-5 north of downtown at Old Town Avenue and follow the signs. Parking is free. The San Diego Trolley (the train-style trolley that also goes to Tijuana) stops in Old Town. So does Old Town San Diego Trolley Tours (a motorized coach).